이 책판은 고려 고종 6년(1219) 6월에 부석사에서 판각한 것으로 판각장소와 년대가 분명한 책판으로는 가장 빠른 시기에 속한다. 고려시대의 책판으로 현존하는 유물로는 고려 고종23년(1236)에서 38년(1251) 사이에 판각된 고려 재조대장경인 팔만대장경판(국보)과 불교관련 서적의 책판이 대부분이고, 일반도서의 책판은 수종에 불과하다. 이 책판의 성격은 인간이 범백사(凡百事)를 행할 때에 날짜에 따라 정해진 길흉(吉凶)이 있다고 보는 성명학(星命學 : 운명학) 및 오행사상(五行思想)에 따라, 사안(事案) 별로 길일과 흉일을 월별로 나누어 횡간식(橫看式)으로 기록한 것으로, 택일(擇日)에 참고하기 위하여 관련되는 각종 유서(類書)에서 휘집한 선택서(選擇書)의 일종이다. 한 면에는 흉일에 속하는 구초일 종식(九焦日種植) 등 11가지 사안을 제목화 하여 제시하고, 월별로 해당 일자를 간지로 표시하였는데, 그중에서 장단성일(長短星日)과 천지앙일(天地殃日)조에는 장문의 주석을 달아 이 날을 범했을 때 따라오는 모든 재앙을 설명하고 있다. 특히 주목되는 점은 실수로 장단성일을 범한 경우에도 광수공덕(廣修功德)의 방법으로 재화(災禍)를 면할 수 있다고 한 것인데, 이는 불교를 통하여 공덕(功德)을 쌓으면 재앙을 면할수 있음을 말하고 있는 것이다. 고려시대에 오행사상(五行思想)과 결부된 성명학(星命學)과 불교의 관계를 엿볼 수 있는 단서를 보여주는 자료로 생각된다. 당시 대찰인 부석사에서 원당주(願堂主)가 이름을 밝히며 이러한 책판을 간행하였다는 것은 포교와 방식과 관련하여 주목할 만한 일이다. 다른 1면에는 밭갈기에 좋은 날 등 농사와 관련된 길일에 속하는 사안 20가지가 같은 방식으로 열록(列錄)되어있다. 이 책판은 비록 1장에 불과하나 판각시기와 판각장소 및 판각자가 밝혀진 책판으로는 초기의 것에 속할 뿐 아니라, 그 내용도 일반인의 생활과 관련된 사안들이라는 점에서 13세기 초의 불교학, 서지학 및 민속학적으로 중요한 연구자료가 된다. This printing block was carved in June 1219 (the 6th year of the reign of King Gojong during the Goryeo Dynasty) in Buseoksa Temple, and is one of the oldest printing blocks with a clearly established date and place of carving. Printing blocks surviving from the Goryeo Dynasty are mostly for Buddhist texts, exemplified by the National Treasure-designated Tripitaka Koreana, carved between 1236 (the 23rd year of King Gojong’s reign), and 1251 (the 38th year of the same reign). As for non-religious texts, the extant examples are only a handful. 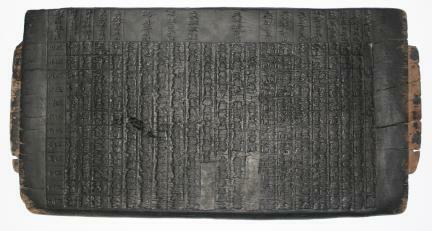 This printing block is carved with a horizontally-written text that lists auspicious and inauspicious dates for various activities, based on divination systems such as unmyeonghak (natal astrology) in which any given date is believed to be either auspicious or inauspicious and the ohaeng (five elements) theory. This book, intended as a reference for choosing dates for various family events or farming and household activities, is a compilation of selections from different books on related themes. On one side of the printing block, there is a list of titles that are eleven activities including sowing and planting on a gucho day, an inauspicious day. Each date, organized by month, is expressed in sexagenary terms. In the entries on jangdanseong and cheonjiang days, long notes are provided, explaining calamities that may be expected, should certain activities be carried on these days. Interestingly, it is said that even if proscribed activities were conducted on a jangdanseong day, the associated calamities could be avoided through ‘gwangsu gongdeok’; in other words, by engaging in charitable deeds recommended in Buddhism. This detail is an important clue as to the relationship that existed, during the Goryeo Dynasty, between the natal astrology based on the five element theory and Buddhism. The information carved in a corner of the printing block that this book was published in Buseoksa Temple, then a major temple, by a person who held a rite there – whose name is also specified- is noteworthy in relation to the methods used around this period to propagate Buddhism. On the other side, twenty farming activities that can be carried out on auspicious days are listed. Although a single block, this printing block is of great value, given that it is one of the oldest printing blocks with a clearly known date and place of carving and the name of the maker also known. Meanwhile, as the text pertains to everyday activities of ordinary people, it is also invaluable for the study of folklore in the early 13th century, as well as for the study of Buddhism and bibliographic research into this period.